1930 Chicago Labor Day Demonstration. 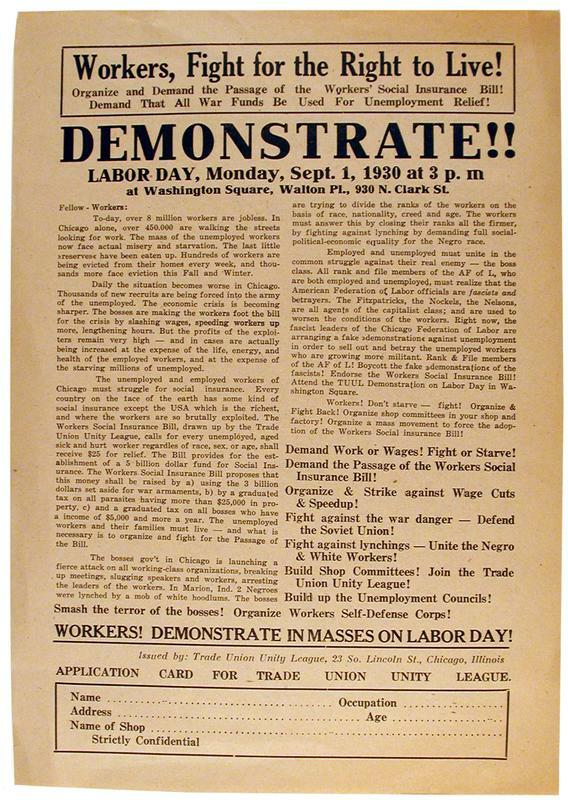 Leaflet issued by the Trade Union Unity League (TUUL) calling upon workers to demonstrate on Labor Day for jobs and in support of labor’s struggles. The TUUL was a Communist-led labor federation that concentrated its efforts on organizing the largely unorganized mass production industries. Unlike the “craft union” American Federation of Labor, the TUUL organized on an “industrial union” basis and in this respect was a forerunner of the Congress of Industrial Organizations (CIO).